The control of an immune-mediated ocular disorder typically requires chronic medications, regular follow-ups, and periodic diagnostic testing. This article presents routine guidelines used in the treatment of immune-mediated ocular disorders. The goal of any treatment program for an immune-mediated ocular disorder is complete remission prior to the tapering of any prescribed anti-inflammatories. High initial dosages of multiple medications are preferable to lower maintenance dosages. Adverse effects are not diminished by lower dosages of steroidal anti-inflammatories, but the efficacy of these drugs is. An initial course of low-dose therapy would therefore increase the likelihood of complications without promoting a positive outcome. Initial ocular instillations of steroids should be frequent. For example, in the treatment of uveitis (Figure 1) prednisolone acetate is instilled every 6 hours, or in severe cases every 1 to 2 hours, for the first 3 days of treatment. Neomycin-polymyxin-dexamethasone ointments may also be applied each evening to help deliver steroids throughout the night. Multiple medications are typically prescribed to affect different aspects of the immune system and supress its reponse. Steroid anti-inflammatories may act as the foundation of therapy for uveitis but other corticosteroid-sparing agents (associated with fewer adverse systemic effects) should also be prescribed. These include antimetabolite medications (e.g. methotrexate, azathioprine, mycophenolate), T cell calcineurin inhibitors (e.g. cyclosporine, tacrolimus), and alkylating agents (e.g. cyclophosphamide, chlorambucil). Initial treatments for immune-mediated disorders typically include both topical and oral steroids rather than nonsteroidal anti-inflammatory drugs (NSAIDs). In the early stages of an inflammatory cascade mast cells degranulate releasing histamine, proteoglycans, and proteases. Phospholipase within mast cells hydrolyze membrane phospholipids to arachidonic acid which is then metabolized to prostaglandins by cyclooxygenase, and to leukotrienes by lipoxygenase. Released prostaglandins increase vascular permability generating the classic redness, swelling, and pain associated with an immune response. Leukotrienes attract white blood cells to an inflammatory site. Corticosteroids inhibit both cyclooxygenase and lipoxygenase, whereas NSAIDs only inhibit cyclooxygenase. Steroids, but not NSAIDs, will therefore decrease the chemotaxis of damaging white blood cells to the eye. To be effective steroidal ocular anti-inflammatories (e.g. prednisolone acetate, neomycin-polymyxin-dexamethasone, tobramycin-dexamethasone, difluprednate, loteprednol etabonate) must penetrate the eye. Lipophilic steroids for optical instillation are typically supplied in a lipophilic suspension or emulsion. These medications pass through the lipid layer of the cornea better than hydrophilic steroidal salt solutions. Suspensions (eye drops) must be shaken prior to instillation to assure consistent dosing. Topical steroids only penetrate the eye to the lens. Inflammation within the posterior segment of the eye is therefore treated with oral steroids and other systemic medications. Topically applied cyclosporine does not enter the cornea and suppres an ocular immune response. Cyclosporine must be delivered orally, or via an intraocular implant, to affect an ocular immune response. A patient’s blood supply is an effective route for anti-inflammatories to reach an eye. Oral medications achieve higher local concentrations and are therefore more effective than topicals in suppressing immune responses within the eyelids, sclera, and conjunctiva. If you have any further questions regarding immune-mediated ocular disorders, please feel free to consult with a veterinary ophthalmologist. Figure 1. 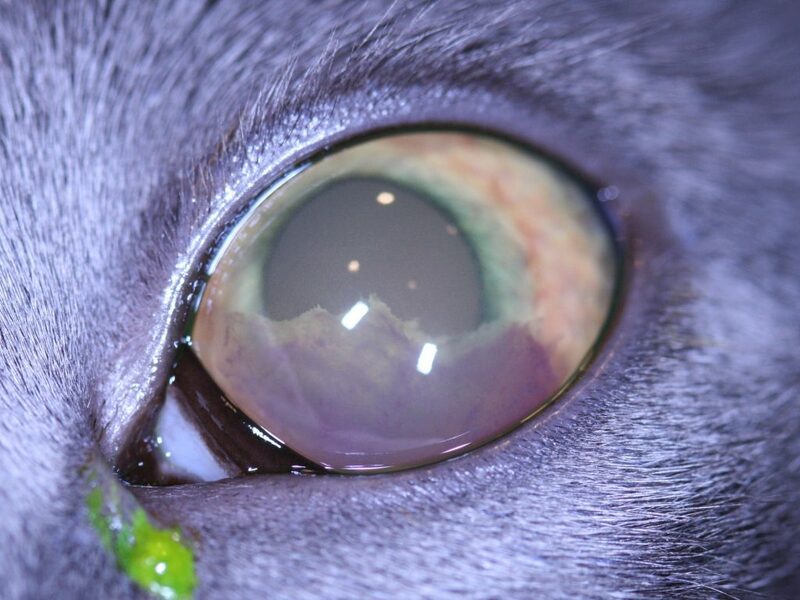 Uveitis in the left eye of a 3-year-old female spayed domestic short haired cat.